Notes: Blank panel for Intellijel 1U spaces. Made from high quality brushed aluminium that matches the 1U modules. These can also be used for DIY purposes if you drill/mill them to fit your own custom circuits. 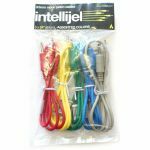 Assorted colour patch cables with length of 24"
Excellent quality patch cables for use with Eurorack modules. 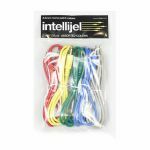 Assorted colour patch cables with length of 6"
Assorted colour patch cables with length of 12"
Notes: The Intellijel 104TE x 4 HE Case with Power Supply is a Eurorack module case used to house individual unit modules. These cases are high-quality anodized aluminium and include a TPS30 power supply. 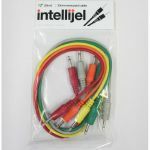 An extra 1U row has also been added to accommodate Intellijel's 1U series modules. Notes: The Atlantis is heavily inspired by the architecture and sound of the classic Roland SH-101. It has always been one of our favorite synths and we really liked how the seemingly limited architecture allowed for all sorts of creative and musically useful sounds to be easily generated. In the mixer section you can adjust the balance of the primary oscillators waveforms including a sinewave which is normalled to the EXT IN jack. You could also patch in one of the modulation oscillators waveforms into this channel and be able to operate the Atlantis as a proper two oscillator synth. There is a switch labelled "LINK" which enables the modulation vco pitch to be based as an offset of the primary VCO. This is useful when using it as a stacked dual vco or when you have the mod VCO acting as the linear FM source for the primary vco and wish to maintain the ratio. Notes: TRS jacks for the Audio I/O interface in 1U. This module is not needed if you have the 7U performance case that comes with rear mounted audio i/o jacks. Notes: Dual 1 x 4 buffered mult (one audio or cv signal in with multiple buffered outputs). The output of the first mult is normalled to the input of the second mult to create a 1×8 buffered mult. Notes: Dual 1 x 3 buffered mult (one audio or cv signal in with multiple buffered outputs). Notes: Cylonix and Intellijel have collaborated to bring you a very sophisticated and deeply complex Wavetable VCO. At the core of this module is very powerful FPGA board that he has pushed to the absolute max of its capabilities and crammed full of features. We wanted to create a module that really worked well in the modular context so there are a lot of modulation and control possibilities. Oscillator 1 can be operated in a CHORD mode, which runs 8 copies of the oscillator in parallel with adjustable detuning, leading to very fat, rich waveforms. The oscillators have extensive modulation capabilities including audio rate (98KHz) Frequency and Phase Modulation (FM and PM) via external sources. Nonlinear combination processes allow the outputs of the two oscillators to interact to generate complex timbres and sonic textures. There are 64 user selectable chords. module to add analog warmth and metallic rasps to the digital oscillator output. External signals can also be patched in. The module includes a sophisticated preset mode where panel settings can be stored. There are 12 user-programmable preset slots and another 52 volatile slots that can be used as a scratchpad. These scratchpad slots are initialized to interesting presets on module powerup. The capabilities of the preset mode is not limited to mere passive storage of settings, however. In this mode the user can also step through, or sequence, the settings, either in order or randomly in response to pulses input to the external sync input. This gives the user the ability to generate complex sequences of sounds. The preset mode also allows the user to morph between the current panel settings and a preset providing a very powerful real-time performance tool. Notes: Digiverb is a lo-fi reverb effect unit that uses an Accutronic digital reverb "tank" module. The sound is somewhere between a virtual spring reverb and a dense multi tap delay but the effect is quite musical and interesting. Notes: High quality headphone amp capable of driving consumer and studio grade headphones with excellent bass response and loud levels. This module can also be used as a line level stereo output. - Output routed through a specially selected Edcor transformer with highly desirable saturation qualities. - Sidechain routed through a voltage controllable SVF filter with LP, BP and HP modes. A trimmer on the PCB allows you to adjust Q. This filter can be used independently of the rest of the module. - External sidechain input allows triggering of the compressor with external sources. - Link IN/OUT allows two Jellysquashers to be chained together for stereo operation. - Full CV control of sidechain cutoff, threshold, ratio, attack time, release time, and makeup gain. - Wet/Dry control allows for "New York" style compression where there is a blend of the dry and compressed output signal. - LED bargraph with selectable display modes to view the signal level in VU or the gain reduction in dB. Notes: This module allows you to connect balanced line level audio (+4 dBu) into your Eurorack modular system. It is a compact and easy way to patch in a rack mount/desktop FX units, external line-level instruments like synths and drum machines, outputs from your DAW, or many other line level sources. Notes: The Metropolis is a unique and powerful musical sequencer inspired by the Ryk M-185 (a Roland System 100m format sequencer.) but with many additional enhancements and functions. The Metropolis comprises eight "STAGES", each with its own assignable gate mode, pulse count and pitch value. Each stage can also have a special slide or skip function activated too. The slide functionality is a constant time portamento very similar to the Roland TB303 (unlike most synths/sequencers that use constant rate portamento) which produces a very musical and interesting result. Notes: Mixup is a versatile, expandable audio mixer for Eurorack format. It has eight inputs (6 on the front panel) and two outputs. Inputs 1 and 2 are single-channel mono inputs, each with its own mute switch and level control; Input 3 is a dual-channel stereo input with a shared mute and level control; and input 4 is an auxiliary unity-gain, non-mutable stereo input. Using bus connectors on the back panel, you can chain multiple Mixups together in series, giving you the ability to mix together even more inputs, or to create sub-mixes for routing around larger systems. Because Mixup is designed specifically for audio (and not for CV mixing), it uses AC-coupled circuitry (which reduces the potential for 'pops' when muting and unmuting audio), and it uses audio-grade, logarithmic attenuators for a smooth, even response across the entire volume range. Notes: This is the third generation of Intellijel's much loved Korgasmatron filter designed in collaboration with David G. Dixon. The Morgasmatron features two completely independent six-mode filters (labelled "A" and "B") - each with its own mode-select knob, input, output, cutoff, resonance, Q-drive and gain control. Each filter has a pair of CV inputs (one with a built-in attenuator and the other with a built-in attenuverter) for modulating cut-off, and another CV input for modulating resonance. Both filters self-oscillate at maximum Q, and produce pitched sine waves that track the two separate 1V/OCT inputs. You can use the two filters independently of one another, or you can use them together (in either a series or parallel connection) and smoothly crossfade between them using either the XFADE knob or the XFADE CV input and built-in attenuverter. You can flip the DRY switches to instantly bypass either or both filters; invert the phase of Filter B; or overdrive Filter A by switching on the new Overdrive circuit. A MIX output provides (as you might suspect) a mixed output of the two filters. On the back of the pcb is a pair of solder points marked as "link". You can connect these (with a solder blob or small jumper wire) to turn the mult into a single 8 channel Mult instead of 2 x 4 channel. Notes: This has to be one of the most fun modules we have ever played with! With just a few audio and CV sources and some inter dependencies (i.e use the Joystick CV to simultaneously modify the signals being processed by the VCAs) you quickly get highly complex sounds that you can easily control and play with. REVERSIBLE! The module will ship with a second faceplate that is designed to mounted upside down (so joystick is at the bottom) and there are jumpers on the back of the module so you can coordinate the reversed orientation of the joystick. This is to facilitate use in a skiff. Notes: The Plog module comprises two programmable logic sections (select one of six different 3 input boolean logic types) as well as a toggle flipflop and data flipflop block. all four sections are linked together via specially planned normals. Notes: The Polaris is a 4-stage cascaded OTA filter designed by David Dixon. It builds on the lineage of the Dr. Octature and Atlantis filters, but with a totally revised core and resonance control. Along with dedicated LP, HP and BP outputs it features a configurable MULTI output capable of an unprecedented 27 different filter modes. With drive turned down the Polaris is capable of buttery smooth filtering, and the cutoff control range has been fine-tuned for playability. With the drive dialled up and the new asymmetric multi distortion circuit engaged it creates a more aggressive sound. Not content to be just a filter, the Polaris's AP phaser mode combined with frequency modulation can be used to achieve a phaser effect. With so much versatility in a modest size, the Polaris is an ideal filter for a starter system and an excellent addition to the tonal palette of a larger modular. Notes: The Quad VCA is a compact and feature packed module that is sure to find its way it almost all of your patches. In addition to being used for standard VCA duties it can also be used as a mixer and signal booster. - Manual LEVEL control per VCA which is convenient when using the module as a mixer or for biasing when CV modulating the VCA with a bipolar LFO. - Dedicated CV attenuators with dual colour LEDs for monitoring bipolar CV signals. - Continuously adjustable response from linear to exponential per VCA. - Each CV input is normalled to the adjacent one for cascaded control. - Each output is normalled to the mix input of the adjacent one which allows you to use adjacent sets as submixes or the fourth output can be used as a master mix output when none of the other outputs are patched. - Each VCA has a boost switch that increases the output level by approximately +6dB (double). Notes: Each function can have a linear or exponential curve. Notes: The shorter and wider brother to the popular Triatt module! - Each output normalled to mix into the adjacent channel on the right making it possible to do sub mixes in groups of 2, 3 or all four channels. Notes: Scales is an 8hp dual-channel note quantizer and step sequencer. Fundamentally, it takes an input voltage, quantizes it to notes in a user-defined scale, and sends that quantized voltage to an output, where you can use it as a melodic pitch source for oscillators or any other module that expects to see discreet note values at its input. Scales goes far beyond the fundamental, allowing you unprecedented control of the pitches and intervals hiding inside your control voltages; turn LFO's into arpeggiators; random voltages into harmonic counterpoint; and unquantized external CV sequencers into chromatically tuned note sequencers. Quantization can be locked to an incoming trigger. There are a number of trigger output options as well, ranging from no triggering (good for pitch shifting drones); through triggers that sync with either of the two outputs (or both); to a trigger or gate transmitted in sync with one sent to the module's TRIG input. You can also use the shift input to switch between scales or to change the root of any existing scale pattern or split Scales into two quantizers - each conforming to a common scale, but fed entirely different voltage sources. Scales also features a 128-step SH-101 style step sequencer (complete with storage for up to 35 fully programmable patterns) - allowing you to feed OUT B with sequenced notes and rhythm patterns, while OUT A continues to function as a standard pitch quantizer for external voltages. You can even sync the sequencer to quantizer events on OUT A. Notes: The Shifty is essentially a combination of four sample and hold stages, a sequential gate and sequencer controller. This collection of functions allows for some specific and useful utility application. One of the primary uses for Shifty is to take a monophonic sequence source and route each new note of the sequence to up to four different synthesizer voices in a specific pattern. In this way you can create pseudo polyphonic sequences since each voice can be triggered to play and sustain while the next voice int the sequence gets triggered. Another term for this is hocketing. The other main application of the Shifty is to function as an Analog Shift Register. In this mode each new gate input received causes the current set of pitches to be shifted to new output locations as a new one is added and the oldest one is replaced. This can be an interesting way to create chords that are up to four stacked notes when used with a pitch sequence source that has a harmonious series of notes (e.g. a pentatonic scale works really well). Even just using two of the outputs will yield very interesting melodic interplay and is an excellent way to make a simple sequence much more complex and interesting. In a more basic way the Shifty could be used as a simple Sample/Track and Hold module or as a sequential gate. Notes: There are many excellent digital reverbs available these days but there is still nothing quite like the timeless and magical character of a true spring reverb. For the Intellijel Springray II, each tank has a totally different set of characteristics, with many unexpected surprises when feeding it through a wide variety of sound sources. One of the most interesting results is how a slow attack saw waveform from a Dixie almost sounds like a realistic cello! Version two of the Springray provides a number of changes and improvements to the original design. The shelving EQs have been replaced with a parametric EQ with frequency, Q, and gain controls. The CV inputs for feedback and mix balance have been replaced with inputs to control the filter frequency and gain. Lastly, the feedback and limiter circuits have been redesigned, and the drive quality has been improved. PLEASE NOTE: Does not include Spring Reverb Tank. Notes: Steppy is a 4-track programmable gate sequencer with eight internal memory slots, external clocking, numerous tweakable parameters, and a performance-first design aesthetic. - Each track has its own length, which can range from 1-step to 64-steps, allowing for polyrhythms, fills, or constantly evolving gate interactions between tracks. - Each track has its own gate length, which ranges from very short to very long, with tied gates possible at the extreme setting. - Each track has its own clock divider, allowing patterns to play out over completely different periods of time. - Each track has its own swing setting, which offsets the timing of every other step. - Each track has its own delay setting, which offsets the timing of every step. - Each track has its own probability control, which sets the likelihood that each programmed gate will fire when called upon by the pattern. - Each track can be shifted (or 'rotated') forward or backward by a number of steps. So if you've created a pattern that 'feels' like it has its downbeat on step 3, you can shift that pattern two steps to the left, so that the downbeat sits on step 1. Tracks can be programmed by entering active steps on the grid or tapped in live as the sequence is moving. Tracks can be selected and modified in real time as the sequence plays. A select button allows you to directly access each track (and each page of 16 steps within that track) directly through Steppy's intuitive multifunction buttons array. Tracks can be individually muted and unmuted, and a special performance mode (called "Loopy") enables you to touch any two gate steps and instantly create a performance that loops between those steps. Notes: Tetrapad is a versatile, multi-dimensional, touch-sensitive control surface for Eurorack. Each of its four pads use force sensing resistors to respond to both the vertical position of your finger and its pressure. Four push encoders and a shift function give you even more tactile control over your modular system. Tetrapad operates in numerous modes - each of which configures the module to perform a specific control task. Through these modes, Tetrapad can emulate a bank of faders; a voltage storage device; a finger drumming surface; a chord generator; an 8-key keyboard; four independent LFOs; or an 8-switch panel. The chosen mode determines what type of signal (CV, note, trigger, gate, etc.) is sent from each of Tetrapad's eight independent outputs, while its multitude of multi-coloured LEDs keep you informed of exactly what's happening within each mode. Tetrapad automatically remembers how you've configured each of its modes and retains these settings when powered off. By default, Tetrapad automatically saves these settings every minute, or whenever you change modes. This makes Tetrapad ideal for live performance, since you know it will always power up with your configurations intact. Notes: This is a utility module we found ourselves always needing and using. The three well spaced knobs can act as active attenuators, attenuverters (bipolar) and inverting attenuators depending on the three position switches. Notes: The uFold is a collaborated design with David G. Dixon. This is the version II of the original uFold. When combining the Dixie, uVCA, uFade and uFold you can achieve extremely complex palette of sounds with just a few modules! Notes: A very handy module for directly monitoring your system with headphones and as a convenient line level output to connect to amplifiers or recording devices. The headphone amp is low noise and capable of driving low impedance studio headphones. Notes: Dual 3:1 audio and cv mixer (up to three buffered inputs with a single buffered output). NOTE: Version 2 of the Unity Mixer has two sets of jumpers on the main pcb. These allow the top and bottom sum to be set to -6dB attenuation instead of unity gain. This creates more headroom when summing higher amplitude sources like raw VCO signals. Notes: USB socket for charging/powering peripheral devices. This tiny but handy module connects the USB A connector to the +5V bus on the Intellijel TPS series powered busboards. Allowing 1A or more of current to be supplied to USB devices such as lamps, phone chargers, and usb powered musical devices. It connects to the bus via supplied two-pin cable. *Compatible with the TPS30 MAX and TPS80 busboards. TPS30MINI board requires an adapter. Notes: Sometimes your ears are not enough and you really need to see the sounds and control voltages you are generating. Zeroscope's two channel design lets you display and compare both control voltages and audio. It's a good old fashioned sci-fi light show! The Zeroscope 1U is an adaptation of the excellent 3U Zeroscope by VPME.DE. - Scope: Standard graphical display, with time displayed on the X-axis and voltage displayed on the Y-axis. - X-Y: Alternate graphical display with CH 1 driving the X-axis and CH 2 driving the Y-axis. - Tune: Alphanumerical tuning display, which you can configure to show either Hz values or note names. The Scope displays have adjustable display offset for each channel and an adjustable trigger threshold, while the tuner has options for reference pitch and average update speed. The inputs are DC coupled and accept signals between -10V and +10V. The Signal on the input is normalled to the output below; this allows you to monitor or tune a signal without a mult or re-patching. Notes: The uMIDI provides all the essentials to control and sync your Eurorack modular from your computer, iPhone/iPad, or hardware MIDI device with a minimum of fuss. No menu diving or configuration scripts, just two buttons. The connectivity, feature set, and compact size make the uMIDI ideal for integrating your modular with the rest of your rig while not taking up too much space in your case. The lower half of the uMIDI gives you everything you need to control a single voice synth via MIDI. Just connect either a USB or DIN MIDI cable to the module, LEARN a channel, and start playing. Notes: Plonk uses a technique known as physical modelling to synthesize, with great realism, the way in which sound is produced by acoustic instruments. The Plonk module is, itself, focused primarily on creating percussive sounds - both pitched and un-pitched; natural and unnatural; acoustic-sounding or totally electronic. Plonk does this by breaking sound creation into two distinct elements - the exciter and the resonator. The exciter is a mathematical model of the device used to strike a particular surface. Plonk, because it's percussion oriented, has two types of exciters: one modelled on a mallet, and the other providing a noise source. The resonator is a virtualization of the object being struck, which vibrates, resonates and creates the body of a sound. Plonk offers several types of resonators: beam; marimba; drumhead; membrane; plate; and string. Plonk provides numerous parameters that let you shape, mould and design both the exciter and the resonator, thus enabling you to synthesize the sound of striking or scraping almost any type of object - real or imagined. In this way, Plonk can accurately model the sounds of kicks, snares, toms, cymbals, claps, tablas, congas and all manner of traditional percussion instruments. It can also model pitched percussive instruments, like vibes, marimbas, and even bass or guitar-like tones. Of course, it additionally excels at modelling instruments that heretofore never existed. Best of all, the sounds created by Plonk are not static - any sound you design can respond dynamically to velocity, as well as four different modulation inputs. This means the sound of Plonk can change completely from note-to-note (or strike-to-strike). Because of this, Plonk is actually a duophonic (2-voice) module, which lets the sound of one note decay naturally when a second note (possibly employing an entirely different set of modelling values) is struck. Thus, hitting a new note does not choke the sound of the previously struck note (unless you want it to, of course)! Plonk stores up to 128 patches in its internal memory, and ships with many presets programmed by professional sound designers and composers. You may overwrite these patches if you wish, and banks of patches may be transferred via MIDI System Exclusive over Plonk's built-in mini-USB port to facilitate offline storage by programs or websites that support this capability. Plonk was developed in cooperation with Montreal-based Applied Acoustics Systems - physical modelling pioneers, and the creators of Tassman, Lounge Lizard, String Studio, Ultra Analog, Chromaphone and numerous other plugins. 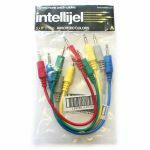 It is with great pleasure that Intellijel brings the potential of this physical modelling technology to a hands-on, CV-laden device capable of the sort of dynamic control and sonic exploration that modular synthesists demand.